With the effect of the financial year 2019-20, Its now quite easy for the Public of India. Rebate has been provided in the year Income Tax Slab. National Pension scheme (NPS) is now more Interesting. Here we have extracted top ten points for all of you to know in the upcoming financial year. 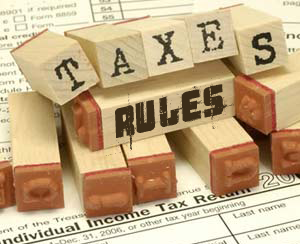 No Tax up to Rs. 5 lakh - In the new financial year 2019-20, You have your income in the range within 5 lakh then you are exempted to give tax. No Tax on Second House - If you have two houses and second one is vacant then it will be considered as occupied by you, and no liable to pay any tax. Rs. 50,000/- is the New Tax Deduction Limit - Earlier it was Rs. 40,000/-. TDS range has been extended from 10,000 to 40,000. It means that you are free to earn interest from Bank, Post office. GST has been lowered down so, now its easy to buy Home as 5% tax will be imposed on the under construction houses inspite of 12%. If you have Physical Shares of the company then you wouldn't be able to either buy more or sell it. Connect Railway Two PNR in One ticket. You can also get refund of the connecting train is passed away. PF (Provident Fund) Transfer will be now Automatic. Right now, there was separate Application system for the withdrawal. Composition Scheme has been now increased, now You can register in GST if you have annual trading of 1.5 Crore and above. Aadhar and PAN Linking is now mandatory other wise it will be rejected for no use. So, here are the top ten updates from the financial point of View. Here is the good news for all Kaun Banega Crorepati fans. 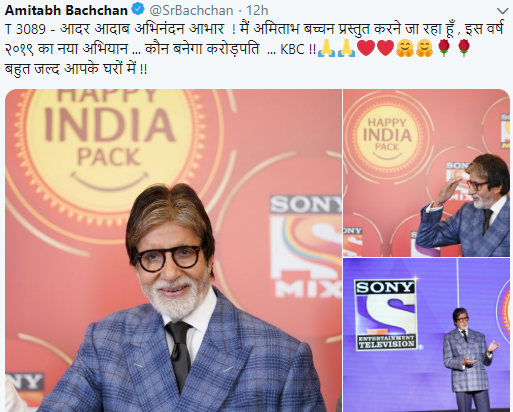 KBC Registration is going to start soon on Sony TV. In Year 2019, we are going to have another Big Show on Sony TV. 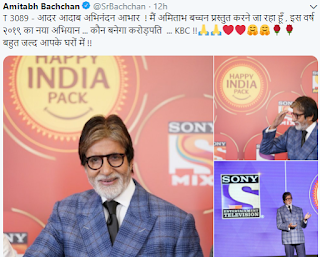 The Host of the show will be again Amitabh Bachchan and lots of Amount will be won this year. Well, first of all Promotional Videos will be in action, then Registration will take place. The mode of Registration will be through SMS, IVRS, and via Sonyliv App. Ques : In the Mahabharata, who was the only Kaurava to have opposed Draupadi's 'Cheer-haran' and her being dragged into court by force? FAST PREPARATION FOR ADDING THE CRIME AND CRIMINAL TRACKING NETWORK SYSTEM IS GOING ON. ALL THE POLICE STATIONS WILL BE CONNECTED TO NATIONWIDE NETWORK SYSTEM TILL 2019. · FROM F.I.R. TO WARRANT WILL BE ONLINE. · FORENSIC SCIENCE LABORATORY WILL ALSO BE ADDED. 1064 POLICE STATIONS IN THE BIHAR STATE ARE NOTIFIED TO GET ADDED. IT CAN BE FILLED BY ONLY THOSE INDIAN CITIZENS WHOSE ANNUAL INCOME (COMBINING SALARY AND OTHER RESOURCES SUCH AS PROPERTY OR INTEREST) IS 50 LAKH OR LESS. FOR THE FINANCIAL YEAR 2017-2018 NRI CANT FILL THIS FORM. IN THIS INTUITIVE FORM,FULL INFORMATION ON THE SALARY HAS BEEN SOUGHT. IN THIS YOU WILL HAVE TO GIVE INFORMATION RELATED TO ALLOWANCE,BENEFIT APART FROM SALARY,THE COST OF THE FACILITY AND DEDUCTION INFORMATION UNDER SECTION 16. HOWEVER ALL THIS INFORMATION ARE GIVEN IN FORM 16,BUT NOW IT WILL ALSO BE GIVEN IN THE RETURN FORM. ON PAYMENT OF RENT MORE THAN 50 THOUSAND TDS FACILITY IS THERE. NOW TO GET THIS TDS A SPECIAL COLUMN IS GIVEN IN WHICH YOU CAN GIVE ITS NOTICE. Whatsapp payment feature service will be made available in India from next week for beta users . For this the instant messaging app WHATSAPP has done partnership with HDFC BANK, ICICI BANK, AXIS BANK and other banks. Process of partnership with SBI is also about to complete. Whatsapp Has Launched The Beta Version Of Payment Service Some Months Ago.But This Service Has Not Been Started Officially. There are about 20 crore whatsapp users in INDIA. This number is 60% of the total population of AMERICA. Present time Aadhar is facing lots of challenges and security Issues.Well, Aadhar system is going to modify itself soon. A new layer of security over Aadhar will make it more secure and reliable. User will need to create Virtual ID for each transaction and procedure they will made in lieu of Aadhar. Any one can create by going over UIDAI website. This 16 digit code will define to KYC. A user can create any much Virtual ID as much as they want and last one will be auto cancelled. In India, we have now only Aadhar required for all verification and Government has decided to link all Mobile Numbers with Aadhar so that Instant Verification should be done an Crime should be stop even all the Information should be directly given to the people of India on their Mobile. Presently If you have to Link Aadhar with Mobile then have to visit Respective Mobile Stores for it. In the Store you have to give your Aadhar Number and Thumb Impression for that. Since India we have lots of old citizens and Disable. That's why Government has given an order to start a Home based Application or service from Telecome companies to ease the process of connecting Mobile with Aadhar with a simple OTP Process. For Aadhar Re-verification the facility of OTP will be given. If you have Aadhar with one Mobile Number on that then it will be verified with a simple OTP. well, Government has given order to start online service for Re-verification of Mobile with Aadhar. Presently In India we have Airtel, Jio, Idea, Uninor, BSNL, Aircel as the main companies. The link for Aadhar Re-Verification will be displayed soon... Till then wait for 2-3 days. In a bid to expedite linking of mobile phone numbers with Aadhaar, the government Wednesday announced three new modes to complete the process from the comfort of home. Telecom Minister Manoj Sinha said mobile numbers can be linked with Aadhaar through OTP (one time password), app or IVRS facility. This has been done to simplify the process and make it convenient for people, the minister said. While the authentication of mobile phone number with Aadhaar, a process called re-verification, by visiting stores of telecom firms will continue, the government has also ordered the companies to carry out the exercise at the doorsteps of the disabled, chronically ill and senior citizens. For users who do not have the 12-digit biometric identification number, a separate mechanism for e-verification – an exercise designed to weed-out dummy and unscrupulous users – will be put in place shortly, a source said. For instance, such verification could be done through passports (in case of NRIs) or ration cards, the source pointed out. OTP mode will leverage the mobile number which is already registered with the Aadhaar database, and can be used for re-verification of subscribers’ other mobile numbers too. Operators have been directed to facilitate request for the OTP to e-verify the cell phone numbers through websites or mobile apps. Keying in the OTP would complete the process seamlessly. Similarly, the Interactive Voice Response System or IVRS can be used as also verification through specially designed apps. Nearly 50 crore mobile numbers are already registered in Aadhaar database, and the OTP can be leveraged for re-verification in all of these cases. Sinha said the telecom operators should provide an online mechanism for people to request for doorstep verification for disabled, critically ill or old persons. In case of agent-assisted biometric authentication for SIM re-verification or issuance, telcos have been asked to ensure that full e-KYC details of subscribers are not made visible to the agent. Nor should data be stored on the agent’s device. In the current dispensation, e-KYC data of the subscriber including photograph is visible to the agent of the telecom operator. The government has made it mandatory to link Aadhaar cards with bank accounts, permanent account numbers (PAN), income tax return (ITR), social security schemes and mobile phones. The deadlines for each vary. The deadline for linking Aadhaar with PAN for tax returns is December 31 and the same for linking the biometric number with mobile number (SIM) is February 6, 2018. The announcement came on a day when the government told the Supreme Court that the deadline for mandatory linking of Aadhaar to avail benefits of various government schemes would be extended till March 31 next year. Bharat Bill Payment System (BBPS) is now live on the Digital Seva Portal. All are requested to make the mobile, electricity and other utility bill payments through the BBPS Platform. Convenience, Time Saving, Uniform experience and flexibility of payment channels. Reliable service with high degree of trust and security. Transparent pricing with instant payment confirmation. A Unit of Manavta Technology Ltd.
A Business Opportunity for the 10th and 12th passed having knowledge of computer to set up Manavta Grahak Sewa Kendra in their town, village, Panchayat and Ward. First Registration Question - In which kingdom is the story of the ‘Bahubali’ series of films mainly set? Ques : In which kingdom is the story of the ‘Bahubali’ series of films mainly set? e.g. 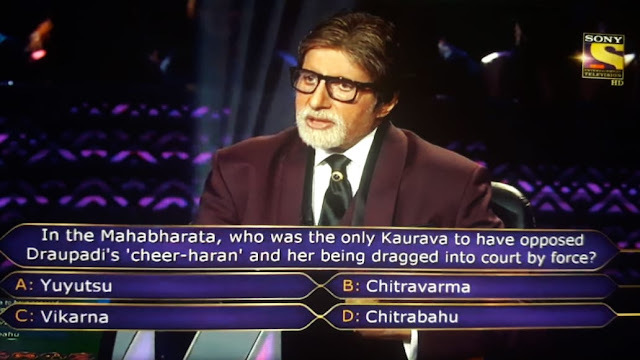 : If the correct answer to the question aired is "A" according to you, you are 21 years and 10 months old and are a male; you are required to send "KBC A 21 M". There is a critical vulnerability (Microsoft Security Bulletin MS17-010) in various versions of Microsoft Windows (client as well as server) which is being used to spread ransom-ware across the globe. The ransomware is spreading like wild fire infecting critical installations like healthcare globally. (Please also refer https://www.microsoft.com/en-us/security/portal/threat/encyclopedia/Entry.aspx?Name=Ransom:Win32/WannaCrypt ). The Ransomware in question has been identified as a variant of ransomware known as WannaCry (also known as 'Wana Decrypt0r,' 'WannaCryptor' or 'WCRY'). Such ransomware infection typically leverages social engineering or spam emails as a primary attack vector, tricking users into downloading and executing a malicious attachment. The Indian Railway is going to launch a mega App to get every information related to trains.The name “HIND RAIL” has not been finalized yet. Through this smartphone application, people can inquire trains information e.g Arrival-Departure,Delay Time,Cancelled Trains,Platform No.,Running Status and Berth availability at one place (Hind Rail App). They can book Taxi,Retiring room,Hotel,Tour Package,E-catering services etc…through the app.And People can get exact delay time of a particular train with the help of this app.This App will be launched in June’2017 as said by an official. How Modi can make you rich? Want to buy a stake in an aircraft-carrier builder? How about a fighter-jet maker? India is about to start an $11 billion sale of government assets, including holdings in the shipyard and factories that supply India’s military, offering investors a share of some of the region’s more profitable manufacturers that are benefiting from soaring defence spending. India is the world’s largest arms importer and Prime Minister Narendra Modi wants to change that while at the same time raising money to reduce the fiscal deficit. 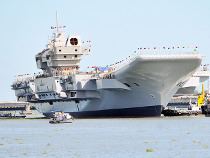 Among the biggest stakes to be sold are in Hindustan Aeronautics Ltd., or HAL, which is trying to build a domestic fighter, and Cochin Shipyard Ltd., currently building India’s first home-made aircraft carrier. The shipbuilder has seen profit almost double in the last five years, while earnings at most big global shipyards have slumped. Yes, definitely, India possess special and unique habits, customs, lifestyles, cultures, which are being always pomped differently from rest of the nations. We Indians can be easily lifted up by the sound of "foods, cricket, end-of-season sale", no matter how much sad or grumpy we are at the moment. Nevertheless, for my nation, Indians with business stakes in the US, or anything incorporating the government, whole issues are always being resolved and clarified. Indians are trend settlers globally, being this success driven and being a proud people who stops at nothing. And yes, there is so much for the people to covet our culture when there is lots of reason to drop of being among them. People across the globe are inspired by the stories regarding Indians dispersing into the corners of the world with only their smartness with them and thus, conquering heights of success despite all odds. Indians are a sculpture of perseverance and pride. Till today, it was very cumbersome to have PAN, the process of verification got easier when the concept of Aadhar was introduced. But now Income tax Department is ready to introduce the concept of E-PAN. Department is providing Electronic Pan Card to the users and for that Emails are being sent to the users. Digitally signed e-PAN can be used as Identity Card. Other than that e-TAN will also be issued, so one single form can be filled for PAN and TAN. Income tax claims that it had issued 10,894 pan card within 4 hours of Application. Thank you for registering for Samsung Pay Early Access Program. The Early Access Program is live now! We urge you to start using Samsung Pay by following the below steps. When we use ATM of State Bank of India with its or, sister ATM or of other Banks then we usually get the message with several error. Every error has some Response code and pertending to some sort of Message. Here are the Description of the Response code you always receive. 1. Minimum 3 times deposit free in your account, After more then 3 times deposit you will pay 50/- per deposit. 2. Minimum 5000/- balance maintain in metro city branch account holder. 4. Minimum 2000/- balance maintain in semi urban area branch account holder. 5. Minimum 1000/- balance maintain in villages branch account holder. 6. If you not maintain minimum amount in your account you will pay up to 200/- + extra surcharge. (depending on how many days). How to earn with Facebook Video? Facebook will launch a new feature for its user to earn by uploading videos on the site soon.This will be possible because of advertisements which come while streaming videos . Advertiser of the product will pay facebook for advertising their products and the Product advertisement will be shown on our videos .According to the Source , Facebook is going to launch “mid roll” Ad format .This will help in uploading videos and Publishing such that its User will earn.